Human Will Be Forgot. Their History Dust. 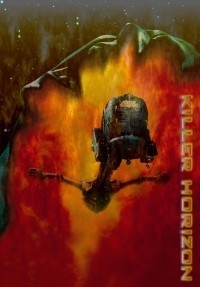 The idea is to tell a bleak and bloody science fiction horror story using Event Horizon. The narrative has been considerably altered and I hope I have added a few more scares. I will let you judge if this works or not. To make sure that the Single Layer DVD is of the best quality, most extra features were removed. 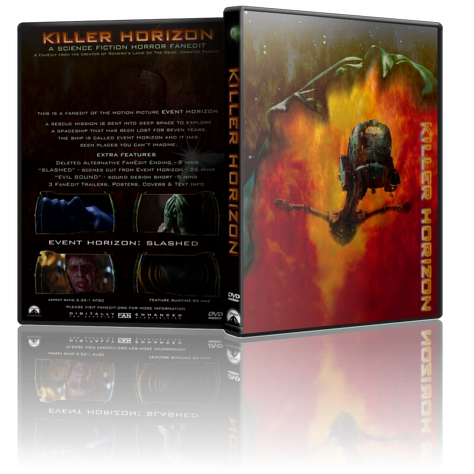 A short called “Slashed”, which has scenes cut from Event Horizon, is available to download as a separate avi. The deleted unfinished alternative ending and “Evil Sounds”, the sound design short film are available as avi. Thank you to boon23, AVP and ThrowgnCpr for your constant support and help. I would also like thank Transor, Akitsu, FatherMerrin and Ocarina654 (who I miss very much) for your encouragement. Many cuts and additions have not been listed. A grim overhaul of a muddled SciFi / Horror film. Mollo pulls this out of tech and into fire and blackness, heightening the horror elements with relish. Audio/Video Quality - The DVD is not available. Not that I am complaining. This is one of those edits I waited and waited for. Literally. One particular file refused to download and I waited over two weeks, until one afternoon when it started going. For newcomers, patience does bear rewards. The avi image is a little soft and is undoubtedly superior on the DVD version. The audio is muffled at times and I suspect is not better on the larger DVD. Video - 640p, MPEG-4. Well done throughout, in an ambitious edit. Numerous alterations are unnoticed. The additional scenes were worked in nicely. Audio - 2-channel, MP3 128kbps. Man, this is where the edit really shines. This is an outstanding soundscape Mollo has crafted. Do not overlook the extras! The “Evil Sounds” bonus is a clinic on relayering audio channels. Aspiring editors would be well advised to study this. Narrative - Coherence gets lost in this. Of course the film was always a jumble. Dr. Weir seems even odder from the get-go and his usefulness onboard is negligible. An asteroid (from Deep Impact) sweeps past in the beginning for no real reason, though it is in the alternative ending bonus. At the end, Capt Miller sends Lt. Starck to the command deck for intel, and she ... it is not explained. This turns into a flat out horror film with many stray threads and unanswered questions. That is not a problem, a lot of mysteries have no solutions, but there seem to be an awful lot in this edit. The pacing also feels rushed, very much so past the midway point. Enjoyment - Appreciate would be a better word. I recognize and admire much of what Mollo did here. It does feel like a horror film, which was his intention, though not a particularly intelligent one. He removed much of the stupid factor, which is commendable, yet many of the characters are reduced to sketches. I never cared about them, so I never cared what happened to them. Tough luck, kids, I thought. On one hand, the outro music, the last taste one gets from any film, was incongruous, intrusive and irritating. On the other hand, the bonus features, redeemed quite a bit for me. Seeing how much Mollo had done, just with one brief scene, had me recognize and applaud the work he did with this. Adding those bonus features in a folder along with the feature .avi is genuinely considerate. Good edit, worth viewing. Based on other reviews, tracking down the DVD is recommended. so when i saw this fanedit i had to see it. im glad i did it was awesome the whole movie felt new there was so much work that went in to this. i love all the added scenes and the new ending was so good, this fanedit deleted all the cheese and made it a solid scary horror movie. 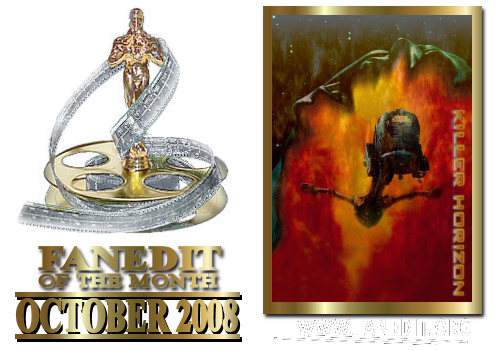 this is a highly recommended fanedit to any scifi horror fan or just any horror fan in general. i watched the avi and the PQ was pretty bad i recommend getting the dvd as you will always watch this version over the original. i highly recommend this fanedit. You know, I've always really liked Event Horizon. It scared the crap out of me the first time I saw it, and I think it's still one of the best in the limited "space horror" genre. So I was really excited to experience the movie in a different way, and I'm happy to report that Mollo did not disappoint. The mood in this version is a lot more serious, with much of the worst character "dialogue" removed (I'm looking at you, Cooper!). The flip side of this is that some of the characters don't make nearly as much of an impression, but I'm going to say that it was still a good move as they're not constantly wrecking the tone with their foolishness. The demonic angle is amped up in this version as well, to great effect. With so much cutting and re-arranging of scenes, some of the original's slow-burn sense of dread is lost, but the added demonic flourishes and adjusted music compensate for that enough to bring everything back into balance. I thought all the integrated footage from other movies worked swimmingly, especially the extra audio elements. The new ending, too, was IMO a smashing success, very artfully done and disturbing. There were a few rough edges, editing-wise, but nothing so glaring that I was taken out of the film, and (while still watchable) I wouldn't necessarily recommend the SD AVI file as it's just too compressed for a film this dark. Great fan edit and a marked improvement over the original film. I liked Event Horizon but felt it was lacking in certain areas. I’ll watch this fan edit a lot more than the original in future.